The KBi BLOCKOR Fitting is the heart of a DIESELMATIC System. A BLOCKOR controls the flow rate of starting fluid being injected into the engine and is also responsible for vaporizing the fluid in the most efficient manner possible. 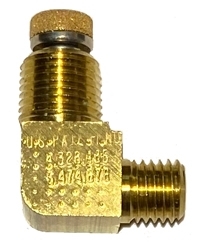 The BLOCKOR is the left hand threaded brass elbow fitting located at the bottom of every DIESELMATIC Valve Assembly. KBi has created a new BLOCKOR fitting that incorporates a threaded filter design as opposed to the O-Ring filter design used in the older style BLOCKOR fitting. This threaded design will eliminate the damage caused to the filter and therefore the metering orifice, from vibration and prolonged exposure to the elements. The new design also incorporates a tubular shaft that has the filter element mounted at one end, creating an annular chamber inside the fitting which will accumulate and trap the particles normally found to have clogged the older filter design. When servicing is required, the new filter can be removed by gently unscrewing the filter unit with a pliers. BLOCKOR's are used and can only be used on a KBi DIESELMATIC or KOMPAC DIESELMATIC System. Metering Orifice's are used and can only be used on a KBi DIESELMATIC NVT or KOMPAC DIESELMATIC NVT System. KBi will supersede all BLOCKOR Fittings with the new Patented filter design. This new design will greatly enhance the life expectancy of the filter and may actually eliminate the need to service the assembly. New BLOCKOR fittings can be identified by the 250XXX part number designation. The old designs were designated as 240XXX part numbers. The new BLOCKOR fittings can also be identified by the Patent Number stamping 5,474,678 found on every fitting. Refer to the KBi Installation - Operation Manual, KBi Form Number 130533, for more detailed information.